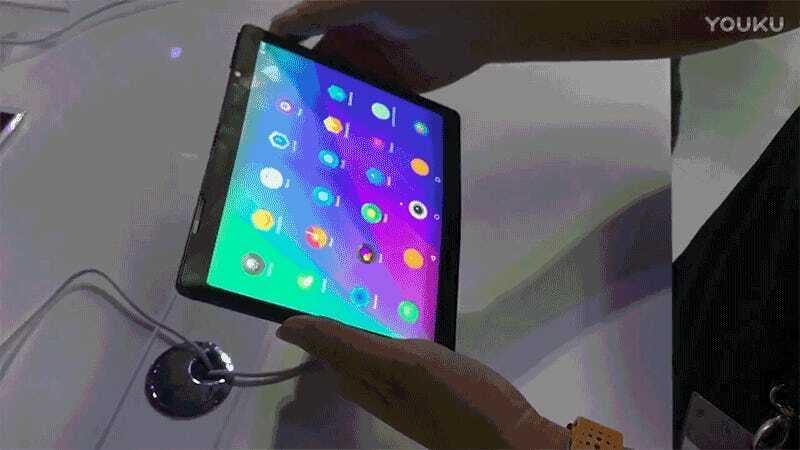 At Lenovo’s Tech World conference in San Francisco last week, the company showed off Folio, a fully-functional prototype with flexible screen that allows it to transform from a smartphone-sized mobile device to a larger tablet. The idea, of course, is to put the best features of both devices into a gadget you can easily carry in your pocket. Like flying cars, folding smartphones and tablets with flexible displays have always seemed like a gadget that’s just a few years away from reaching consumers. We’ve been teased with devices like Lenovo’s Folio before, but they never seem to materialize into a real product. Remember Microsoft’s Courier concept? We know that folding screen technology exists, having seen it demoed at CES and other trade shows over the past decade, but we want more than neat tech demos. I hate having to switch between the iPhone and iPad for different tasks, but trying to read graphic novels or magazines on a small screen is an act of frustration. At the same time, I refuse to upgrade to a Plus-sized iPhone. Juggling multiple devices is less annoying to me than a monstrous smartphone, but a device with a folding screen is the best of both worlds, and a dream I’ve had since first reading about the idea of foldable soft screens courtesy of Arthur C. Clarke. That’s why Lenovo’s Folio has me so excited. YouTuber Kim Poh Liaw captured a demo of the tablet/smartphone hybrid in action at Lenovo Tech World. Although the prototype was only handled by a trained Lenovo professional (it is, undoubtedly, worth a small fortune) the device easily transformed from a 5.5-inch smartphone to a 7.8-inch tablet. Running Android 7.0 Nougat powered by a Snapdragon 800 processor, the Folio’s UI automatically reconfigures itself to take advantage of the available screen space. In the demo, when in smartphone mode, the Folio uses the rear half of the screen to provide a live preview to someone having their photo snapped. But the real appeal of the Folio is having a tablet-sized device, with a larger screen that’s better for working, reading, and watching movies, that can fold down to the size of a pocket-friendly smartphone. Lenovo has no official plans to bring the Folio to consumers any time soon, but there’s still plenty of reasons to be excited about the device. The company managed to incorporate the folding screen technology into a device that looks only slightly thicker than the sleek smartphones and tablets consumers now demand. We’re now one step closer to these becoming a reality, and finally being able to ditch our cumbersome tablets. It&apos;s 2016, So Where Are Our Flexible Electronics?